Courses are subject to change at the discretion of Universidad Nebrija. Students wishing to kick start their Spanish can arrive in Madrid before the regular semester begins and take an intensive Spanish course. The spring early start program is 4 weeks long for 6 credits. Practice of basic Spanish concepts with an emphasis placed on spoken language in order to acquire more security and confidence when managing basic Spanish. Also students begin to have contact with Spain and the everyday life of the Spanish. Oral practice applying contents that are being learned in the Language course. Introduction to modern Spanish customs and traditions of everyday life. Presentation of Spain and the day to day life of Spaniards. Spanish language course with special emphasis on oral communication. Study of the basic grammatical concepts and vocabulary of Spanish, from a functional and communicative approach. Development of oral and written comprehension and expression at a beginner’s level. Students will become capable of managing basic Spanish and come in contact with the Spanish way of life. Concentration on oral practice although all four linguistic skills will be practiced. Students will study general aspects of Spanish culture, keeping in mind geographical and cultural diversity, as well as Spanish current events. This course is aimed at achieving more security with the use of the language and the control of complex grammatical aspects. Special reference to practical applications of learned grammatical structures. This course also focuses on oral practice, but will utilize all four linguistic skills. Students study the general culture of Spain, keeping in mind its geographic and cultural diversity, as well as Spanish current events. Approaching modern Spanish society through commentaries and debates. The class demands students read different texts, as well as linguistic correctness both in oral and written expression. Strengthening comprehension and oral and written expression at a high-intermediate level of Spanish. A reflexive study and practice of grammar structures. General review of the morpho-syntax of the Spanish language from a functional perspective. Study of the major historical events of Spain as well as the most prominent artistic expressions. Study and practice of different aspects of the spoken and written language from the point of view of its use. Analysis of different registers in the practice of the language. Study of specific grammar problems to improve written and spoken Spanish. This course also presents selected themes of Spanish current events, inviting students to debate among themselves, to compare the situation with that of their own country and to make critical comments. It demands linguistic correctness and the study of different events related to the Spanish culture. Students on this program can take up to 5 courses. All courses are taught in Spanish. Recommended credits are shown in parentheses. Courses are grouped according to language level. For example students taking Spanish 101 choose their remaining courses from those listed under the Beginner Level Courses. Course that aims to start communication in Spanish under a functional and communicative approach. The students approach and acquire basic communicative skills to develop in simple situations of daily life. During the course materials of sociocultural content are used. Spanish initiation course with a special emphasis on those grammatical difficulties most common in the level. Basic contents of Spanish grammar are studied to reinforce them while applying the grammatical contents to refer to the present, past and future. The written expression is enhanced. Initiation to the Spanish language focused on students learning to carry out transactions of daily life and socially interrelated in their context. This course will help improve listening and reading comprehension in situations appropriate to the level. Current Spanish customs and traditions in everyday life. Presentation of Spain. Spaniards from day to day. Brief newspaper articles and descriptive texts about diverse aspects of the culture are introduced. Course that continues at the level of initiation (beginner-intermediate) Spanish. It focuses on the linguistic functions necessary to be able to function in everyday life and introduces the communicative contents necessary to cover the entire initial level of language. Complementary Spanish course to develop comprehension and oral and written expression at the lower intermediate level. Students consolidate grammatical content and practice oral expression to acquire greater fluency and confidence in the development of everyday situations and contact with Spain and the way of life of Spaniards. Continuation course of beginner initial level with a functional and communicative approach. The linguistic contents that cover the entire initial level are studied and the student is prepared to begin the intermediate level of Spanish. The acquired knowledge is consolidated and the new grammatical and lexical contents are introduced so that the students can describe personal experiences in the past in different communicative situations. Practice communication in Spanish at an intermediate level. Linguistic uses in order to manage in the real world. Use of essential vocabulary and grammar. Discussions about current events and topics of students’ interest. Course to learn how to develop a conversation in Spanish and practice some strategies that allow students to gain confidence in oral expression. On the other hand, it deals with the composition and elaboration of different written texts. Activities are carried out in order for students to acquire the fluency necessary to exchange opinions and comment on journalistic articles on current issues. A course based on theory and practice, which brings students to Spanish culture through Spanish painting, taking as reference three of its most representative references: El Greco, Velázquez and Goya. The study of these great painters is done by analyzing the historical aspects of the works, as well as the artistic characteristics of composition and style. The minimum level of Spanish required to attend this course is level A2. 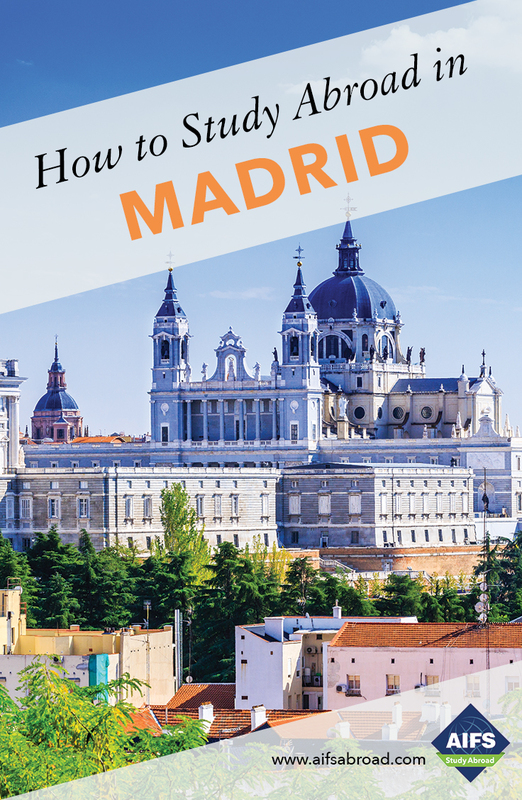 The course includes five visits to the Prado Museum outside of class time. Course to achieve greater fluency in informal conversations and debates, applying and developing students’ grammatical knowledge, from adapted readings. The objective of the course is to deepen the acquisition of reading strategies, to expand the vocabulary and to practice its use taking care of the different communicative situations (formal or informal). Course in which there is a presentation of the different Spanish regions through an introduction to culture, history, gastronomy, monuments and popular festivals. Students’ cultural content is expanded and written and oral expression is practiced through related activities. Intermediate level course with a functional and communicative approach. The linguistic and functional contents of this level are studied as giving and justifying an opinion, expressing in detail personal experiences in the past or, among other things, being able to request specific information, a complaint or explanation about some point of interest. The development of written and oral expression is encouraged. Acquisition and development of the language specifically geared towards legal and economical themes. Read and comment on newspaper articles and specific examples of legal and economical documents. Course that studies and analyzes the Spanish language applied to the touristic sector focusing on specific areas of this sector such as transport, hotels, travel agencies and tour operators. Class work practices communicative situations as well as performing related tasks, which results on an enrichment of new vocabulary on the subject. Advanced level course designed to practice oral and written comprehension while acquiring the functional contents of the level through the study and practice of grammatical structures. Throughout the course the students make readings and debates on the content of literary texts or journalistic articles to learn the vocabulary. Also, texts of popular and cult character are analysed. Advanced culture course in which aspects such as nature, economic sources, culture and history are studied, as well as the society and way of life in the different autonomies that are in Spain. In addition, in a particular way also the main cities and towns characteristic by their traditions and folklore are treated. Advanced level course aimed at achieving greater oral fluency in informal conversations, debates and everyday situations, and greater progress in written expression, all through practice through expositions and written works. Special attention is given to the acquisition of idioms and sayings. Study of Spanish society: education, work, family, youth, health, leisure, everyday life, worries and values. Analyses are based on diverse materials (articles, questionnaires etc.). Study of the different civilizations that occupied the Iberian Peninsula throughout its history and their contribution to modernday Spanish culture. Study of the major historical events that have formed our history and society. A study of the most relevant artistic works. Course in which an overview of Spanish literature is carried out from the 15th century to the present day. At the same time that the students know the main literary movements, authors and literary texts more representative by analysing historical, social and psychological aspects of the Spanish society of the different times. Panorama of the socio-political evolution of 20th century Spanish society through cinema. Each film represents a decade and is intended to establish a debate focused on the events of that time. Analysis and commentary of films and of the moment they represent. Course of acquisition and development of Spanish with specific purposes for the health field. Through this course students receive informative and specialized texts from the area, as well as understand and produce written messages (parts, reports or diagnoses, among others). Also, students will be able to have conversations about them. General aspects. Analysis of the different registers. Language in social communication methods. Broadening and consolidation of language structures and vocabulary. Study of written texts. The course objective is to improve the written expression of the participants. General view of Spanish prose from the post-war period to the present day. Major movements. Analysis and comments on selected texts. Latest trends. Perspectives of a novel. It is mandatory to read some novels. A study of the development of Spanish theatre, with a special in-depth study of the following themes: Lorca, the post-war and the present-day period. Students are required to read some complete works and attend theatrical performances whenever possible. A study and analysis of Spanish in the mass media: press, radio, television, marketing, cinema and the Internet from an oral and written approximation. Development of techniques for elaborating news, scripts and advertisements, as well as for its publication and editing. Pre-advanced level course of applied grammar oriented to promote greater confidence in the use of Spanish and the domain of grammatical aspects that usually generate difficulties in students. During the course, special attention is given to the practical application of the functional contents acquired in the Spanish language course. Pre-advanced level course in which the linguistic and functional contents of this level are studied, such as speaking in detail about hypothetical situations of the present or the past or explaining a point of view about different facts, knowing how to contribute an opinion with nuances. During the course the most problematic grammatical structures are analyzed and the spoken language is given special attention. Proficiency course in the lexical and formal domain of Spanish that allow students to acquire a knowledge and use of Spanish next to those of a native speaker. In this sense, special attention is given to Spanish through reflection in all its territorial, social and communicative variants in order to be able to understand any type of spoken or written language. Study of current topics: youth, education in Spain, women and the family, the work environment and unemployment, leisure time and Spanish values. Analysis of newspaper articles. Study of the major historical events of the 20th century: crisis of the monarchy, proclamation of the republic, civil war (background and development), post-war, Franco’s regime, and the political transition. Political and socio-economical aspects that have shaped Spanish life throughout the century. Review the morpho-syntax of the Spanish language. Specificproblems with grammatical structures at advanced levels. Expressions and idioms. Course that aims to familiarize students with the most common textual genres of academic and pre-professional in Spain. Students will work on different types of written texts while paying special attention to orality. The objective of this course is to understand the artistic characteristics of the main contemporary Spanish painters with work exhibited in the Reina Sofía Museum in Madrid. The course focused mainly on the analysis of the works of Gutiérrez Solana, Juan Gris, Pablo Picasso, Salvador Dalí, Joan Miró and Antonio Saura. Attention is paid both to the style of the painting and to the period and artistic current to which each of the artists mentioned belongs. The course includes four visits to the Reina Sofía Museum, in addition to the corresponding teaching hours in the classroom. Students on this program can take up to 5 courses including at least one course in Spanish from those listed in the Hispanic Studies program. All courses listed below are taught in English. Recommended credits are shown in parentheses. This course analyses how, within current market globalization, International Marketing is not just a mere exportation technique but also a means to systematically establish penetration and consolidation of our business into foreign markets. The course analyzes market information, research systems, marketing-mix, and other strategies from an international standpoint. The purpose of this course is to introduce students to the international perspective of businesses. The topics covered include the competitive environment of the international marketplace and international organizations; the cultural, political-economic and labour forces affecting international business; and management techniques to deal with foreign factors in the international environment. This course deals with multiple functions of management, such as organizing, coordinating, planning, and staffing in an international cross-cultural context. It will focus on the complexity of international management, and students will learn how diverse national cultures affect management functions in different ways. Intercultural communication, expatriate compensation, gender issues, and ethical conflicts will also be discussed. This course describes different factors involved in communication across cultures by discussing cultural variables that enable people to understand each other across group boundaries. The course applies this knowledge to the languages professional setting, focusing on the role that communication has in the creation and dissemination of culture. Students will learn to recognize cultural variables to communicate effectively. This course studies communication as it relates to culture by analyzing its intercultural and international contexts. Students will be challenged to examine questions and issues throughout the semester, which will reveal the processes, effects, methods, and critical norms of communication. All of these matters will be evaluated in relation to interpersonal, group, and mass communication. This course offers an interdisciplinary exploration of the Iberian Peninsula’s civilizations and cultures. Throughout the course, students will explore how the Spanish civilizations and cultures are reflected in Spain’s history, literature, people, politics, and arts. The objective of this course is to offer students a collective view of Spanish culture in its diverse manifestations. This course will cover relevant political, economic, and social aspects of European history and culture by examining the interaction among nation-states and their impact on other parts of the world. Students acquire basic intellectual skills through emphasis on critical thinking, considering questions of why and how events occurred. Topics will include European expansion, political revolutions, Industrialization, nationalism, colonialism, European wars and the European Union. Cinema constitutes a significant force in the construction and expression of cultural identity: it powerfully portrays its nation and provides profound insights into the heart of its people. This course on European Cinema, with a broad geographic sweep, offers students an understanding of European culture, society, politics and history through the medium of cinematographic expressions. The aim of this course on European Cinema is to understand European identity through its cinema and make the students aware that despite its economic unity, Europe is characterized by its cultural, social, political and historical heterogeneity. This course analyzes the foreign policy of states within the international system from different perspectives (political, economical, sociological, etc.). The course will place special emphasis on the study of the changing roles of international and national organizations, non-governmental organizations (NGOs), multinational corporations and public opinion. The course will provide students with a working knowledge of the structure and major institutions of the European Union as well as with an understanding of the cultural and historical trends which have motivated these independent countries to work together in order to develop an Idea of Europe. This course is an introduction to art in Spain over the past five hundred years, focusing on key topics and periods that help to map out the particular nature of Spanish artistic culture. Special emphasis will be placed on the works of artists such as Velázquez, Goya, Picasso, Dalí and Miró. The course includes visits to the Prado, Reina Sofia and Thyssen-Bornemisa museums. This course is an introduction to modern architecture through the study of great buildings and city development in Spain, mainly in Madrid and Barcelona. The course focuses on outstanding architects and works from the 19th century to the present day. Particular emphasis will be placed on the works of Gaudi, Saenz de Oiza, Moneo and Calatrava, and other modern buildings by famous European and American architects. This course analyzes the roles that Spanish women have played for the last 30 years. From the housewife with 3-4 children some 35 years ago, to a modern professional with an average of 1.2 children today, Spanish women are active and influential in every area of Spanish society. The course examines these new roles in relation with politics, literature, economics, education, family, and their impact on the Spanish society. Eligible students must have an advanced level of Spanish and have completed at least five semesters of college-level Spanish. Courses are subject to change at the discretion of Universidad Nebrija. Please visit the Universidad Nebrija website for current course listings. Students with a high intermediate level of Spanish (B2) can participate in this program which combines Spanish language study with an internship. Spanish level B1 will be considered on a case by case basis for students wishing to take an internship in the areas of science and hospitality. Internships have previously been offered in fields including: accounting, architecture, art gallery/museums, arts, music, performing arts, arts restoration, biology, environment (animal protection), chemical and biosectors, education in NGO and schools, engineering, hotels and restaurants, hotel-tourism, human resources, law, marketing, media and journalism, psychology (only in occupational support activities, not psychological) public relations, social work, special education, sports, theater and travel agencies. The internship carries 3 credits. Students can combine their internship with courses from the Spanish Plus or the Hispanic Studies program. Students on the Spanish Plus program take 3 or 4 courses in addition to the internship. Students on the Hispanic Studies Program take 3 or 4 courses for the first two months and then intern for the remainder of the program.